Have you ever wanted to live the life of a high roller, playing at the best tables with beautiful women hanging off your arms? Click here to play! Well, realize that dream in this exciting 5 reel game. 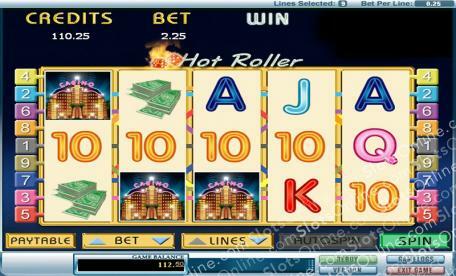 Spin the reels like a high roller and bring in plenty of big wins! Any high roller will tell you that lucky dice are key if you want to win big. That is certainly true in this game. These dice act as a substitute and will replace most other symbols to help you bring in more wins. They will also trigger a bonus feature if you spin them just right. You'll definitely need a beautiful woman to bring you good luck while you're making the rounds at the casino. Spin one to five of the lovely ladies in red and you'll bring in up to 4500 times your line bet. She might want to be treated to expensive gifts. Spin two to five pearl necklaces and you'll get up to 1000 times your line bet. Also helping you live your dream of being a high roller are other symbols such as champagne, chips and cash! You can't be a high roller without getting into the casino. Spin the glowing casino symbol as it acts as a scatter. Three or more anywhere on the board will get up to 100 times your line win! Realize your dream of strutting the casino floors as a high roller in this slots game and you could leave with plenty of green to line your pockets! The glowing casino symbol acts as a scatter. If you can spin this three to five times anywhere on the board, you will win up to 100 times your line wins. The lucky dice act as a substitute. They will replace all other symbols, excluding the scatters, to help you create more wins. They will also trigger a bonus feature. The lucky dice will trigger a bonus feature if two or more appear on the screen and then go on to roll a double or any number. During this feature, you will roll the dice to reveal your bonus prize!